Videos : Hockey fans react to major 75 car accident in the most Canadian way ever! Hockey fans react to major 75 car accident in the most Canadian way ever! There has been some ugly weather in Southern Quebec as of late and on Sunday it resulted in some very significant accidents on the roads. There were at least 2 major pile ups near the city of Montreal, Quebec and although that is obviously terrible for everyone who was involved in the accidents, there was also a rather heartwarming moment of pure Canadia that emerged from those unfortunate incidents as well. A pileup on westbound Highway 40 in Saint-Sulpice, about 20 kilometres east of Montreal, is causing severe congestion for several kilometres. Provincial police say more than 75 vehicles are involved, but only minor injuries have been reported. By about 11:30 a.m., the highway was closed at the 118 kilometre mark not far from exit 122 where westbound drivers were being detoured. More than a dozen ambulances and a dozen tow trucks were called to the scene. Obviously as you can imagine anyone trapped in a situation like this would be extremely frustrated, and it was not even just the people who were actually involved in the pile ups who had to suffer as a result of the accidents. Several stretches of road where completely shut down as a result of the pile ups and that left hundreds of people trapped on closed roads as emergency services rush to help those in need. It was those trapped motorists who provided one of the coolest responses I've ever seen to such an unfortunate circumstance. In one of the most Canadian moments I have ever seen several people got out of their cars and grabbed their hockey sticks in sub freezing temperatures and began to work on their passing skills. 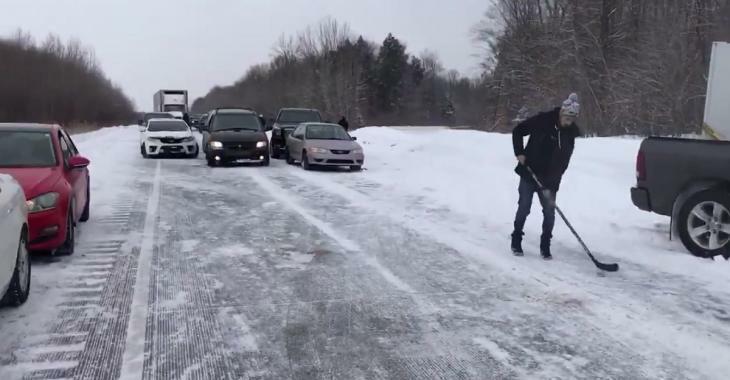 In the video below you can see the people gathered outside their cars passing the puck around on the frozen road, and as the video pans around you can see that even more people are getting out of their cars and grabbing their hockey sticks to join the group that has already started playing.